Taste test: These "Wafers" from India were actually potato chips, specifically narrow-rippled ones, with a good helping of reddish brown seasoning on the surfaces. They had fairly flat shapes, with occasional bits of skin on the edges and dark spots on some chips. 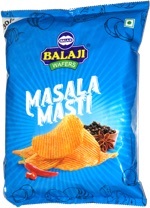 We crunched in to find a tasty mix of Indian spices, not as intense or as hot as the Lay's Magic Masala chips, but a nice flavor and a good taste of India that's rarely found on potato chips. The heat wasn't intense, but there was a nice mild burn that stuck around in the aftertaste. Smell test: Nice mix of Indian spices, fairly mild as Indian snacks go. This snack was discovered by Jeremy at Patel Brothers Indian Marketplace, Waltham, Massachsetts. Review published .